Recent insights in rheumatoid arthritis (RA) necessitated updating the European League Against Rheumatism (EULAR) RA management recommendations. A large international Task Force based decisions on evidence from 3 systematic literature reviews, developing 4 overarching principles and 12 recommendations (vs 3 and 14, respectively, in 2013). The recommendations address conventional synthetic (cs) disease-modifying antirheumatic drugs (DMARDs) (methotrexate (MTX), leflunomide, sulfasalazine); glucocorticoids (GC); biological (b) DMARDs (tumour necrosis factor (TNF)-inhibitors (adalimumab, certolizumab pegol, etanercept, golimumab, infliximab), abatacept, rituximab, tocilizumab, clazakizumab, sarilumab and sirukumab and biosimilar (bs) DMARDs) and targeted synthetic (ts) DMARDs (Janus kinase (Jak) inhibitors tofacitinib, baricitinib). Monotherapy, combination therapy, treatment strategies (treat-to-target) and the targets of sustained clinical remission (as defined by the American College of Rheumatology-(ACR)-EULAR Boolean or index criteria) or low disease activity are discussed. Cost aspects were taken into consideration. As first strategy, the Task Force recommends MTX (rapid escalation to 25 mg/week) plus short-term GC, aiming at >50% improvement within 3 and target attainment within 6 months. If this fails stratification is recommended. Without unfavourable prognostic markers, switching to—or adding—another csDMARDs (plus short-term GC) is suggested. In the presence of unfavourable prognostic markers (autoantibodies, high disease activity, early erosions, failure of 2 csDMARDs), any bDMARD (current practice) or Jak-inhibitor should be added to the csDMARD. If this fails, any other bDMARD or tsDMARD is recommended. If a patient is in sustained remission, bDMARDs can be tapered. For each recommendation, levels of evidence and Task Force agreement are provided, both mostly very high. These recommendations intend informing rheumatologists, patients, national rheumatology societies, hospital officials, social security agencies and regulators about EULAR's most recent consensus on the management of RA, aimed at attaining best outcomes with current therapies. Consistent with our approach to providing recommendations based on the latest evidence, we have continued to evaluate the literature on clinical trials of new agents, new information on established drugs, new strategic studies, new perceptions on outcomes assessments and new insights related to the research agenda16 over the last 3 years. An abundance of new information motivated us to now further update the EULAR recommendations for the management of RA with DMARDs. The SoFs of the SLRs were presented to the Steering Committee that formulated a proposal for an update of the recommendations based on this information. The SLR data and the proposals of the Steering Committee were subsequently presented to the whole Task Force for further discussions and ultimately development of the updated recommendations. The Task Force consisted of 50 individuals, including the Steering Committee members. Among the Task Force members were three patients, two health professionals and two delegates of the EULAR young rheumatologists' network Emerging Eular NETwork (EMEUNET). The rheumatologists were all experienced in the treatment of RA and most had frequently participated in clinical trials; moreover, several of them had experience in patient registries of their countries or in various aspects of outcomes research. The patients and health professionals all had experience in consensus finding activities, as well as most of the rheumatologists. Since we also wished the Task Force's work to be informed by rheumatologists from other regions of the world, aside from a broad representation from 14 European countries, 2 colleagues from Asia, 1 from Australia, 2 from Latin America and 2 from North America were invited to participate. Several of them had actively participated in developing documents of their regional leagues and/or national societies. All Task Force members declared their potential conflicts of interest before the start of the process. The Task Force agreed on a few principal considerations upfront. First, all recommendations needed to be discussed in the context of new evidence; where no new evidence was available, the former evidence base was followed. Second, any of the previous recommendations (4 overarching principles and 14 recommendations) could be maintained as they had been presented in the 2013 version, amended, shifted in sequence or deleted. Third, drugs that were not (yet) approved in Europe but used elsewhere in the world, or drugs that had not yet undergone regulatory assessment but for which evidence from clinical trials was available, could be considered in recommendations to allow for some anticipation of a potential uptake in clinical practice, with all respective caveats. Finally, there was agreement that all recommendations of 2013, which were either further supported by new evidence or lacked novel information, should be incorporated as previously worded, unless certain components were now considered inappropriate. After the presentation of the SLR results and the Steering Committee's proposals for the amendment of the recommendations, the Task Force was split into four breakout groups. One group reviewed bDMARDs, the second group csDMARDs, the third tsDMARDs and the fourth GC; all groups proposed draft language for respective recommendations to the whole Task Force. Safety aspects were addressed in each of these breakout groups. Representatives of each breakout group reported the results of the respective deliberations and presented proposals for the wording of individual recommendations to the whole Task Force. Thereafter, the voting process took place. For an overarching principle or recommendation to be accepted for the final document without further change, a majority of 75% of the votes was required in the first ballot. If this result was not achieved, the respective text was amended and subjected to a second ballot, for which a 67% majority was required. If this ballot was not successful, further textual changes were proposed until a ≥50% majority was attained. The recommendations are presented as finally voted on. The results of the respective last ballot are presented as percentage of voting members. Notes captured the contents of the discussions and the reasoning behind each decision to be presented in the comments accompanying the individual items. For various reasons, not every Task Force member was present in the room throughout the whole meeting and, therefore, there were slight variations in the numbers of votes. However, at every point in time >90% of the members participated in the ballots. After the face-to-face meeting, the recommendations, as agreed by the Task Force, were subjected to an anonymous vote (by email) on the levels of agreement (LoA). Each recommendation received an adjudication on a scale of 0–10, 0 meaning no agreement whatsoever and 10 absolute agreement. During this process, several weeks after the meeting, one individual withdrew from the Task Force, because the inclusion of csDMARD combination therapy in the recommendations had not found a majority during the preceding voting process. This colleague had been present and voted throughout the face-to-face meeting and the respective votes regarding all recommendations are accounted for accordingly, but ultimately the person declined authorship and no vote was cast on the LoA. The draft of the manuscript was sent to all Task Force members for their comments. After incorporation of these comments, it was submitted to the EULAR Executive Committee for review and approval; at this time, it was again sent to the Task Force members. Final remarks were obtained from members of the Task Force and the Executive Committee and addressed in the manuscript, which was then submitted with approval by the EULAR Executive Committee. As before, the 2016 update of the EULAR RA management recommendations reflects the balance of clinical, functional and structural efficacy, safety, costs and patients' perceptions as perceived by the Task Force. Aspect of drug toxicity were considered in the overall wording of the recommendations, but data are presented only in the Safety SLR50 because it is assumed that prescribers are aware of the safety information provided in the manufacturers' package inserts of the various agents. Also, EULAR has developed a series of documents dealing with safety aspects of RA drugs,53–58 and various other publications have addressed these aspects.59–62 In particular, as also suggested by the safety SLR,50 the major risk of bDMARDs (and also tsDMARDs) is related to infections, and recommendations for vaccination56 as well as a score allowing to calculate the risk of infection in patients exposed to bDMARDs have been recently developed.63 ,64 For all medications discussed in this paper, the summary of product characteristics document provides valuable information on risks, side effects and need for monitoring. The recommendations given here should in no way be construed so as to detract from that information. In any case, when toxicity constitutes a major issue, a specific warning is provided within the respective recommendation or the accompanying comments. Of note, the three SLRs as well as the text accompanying each item should be regarded as part and parcel of the recommendation. The individual bullet points represent abbreviated conclusions from the discussions and, as such, do not capture all aspects related to a particular theme; rather, such aspects are elucidated in more detail in the respective explanatory part of the Results section. When classifying DMARDs, the Task Force adhered to the previously used nomenclature12 ,16 as shown in table 1. Table 1 also provides a glossary for terms employed in the recommendations. The Task Force did not distinguish between early and established RA regarding the recommendation of the types of drugs, but rather discerned phases of the treatment process by differentiating between patients who are naïve to any DMARD therapy, patients who had an insufficient response (IR) to initial course(s) of csDMARDs and those who had an IR to bDMARDs. There is currently no evidence for differential responses solely based on disease duration, when leaving differences in baseline damage due to delayed treatment initiation aside. Indeed, trials on MTX-naïve patients with RA used different disease durations for inclusion, which ranged from a few months to several years, without appreciable differences in outcomes on indirect comparison.65–68 However, the Task Force distinguished between early and established RA in terms of the targeted outcome (see recommendation 2). The Task Force also took prognostic factors (table 1) into account, which have similar predictive power irrespective of disease duration.69 Of note, recommendations for the management of early arthritis, including undifferentiated arthritis, have been recently updated.70 The present recommendations address the management of patients with RA from the time of its diagnosis and not pre-RA or undifferentiated arthritis. As in previous versions, the Task Force endorsed the presentation of general principles for the treatment of patients with RA as overarching (table 2). Their nature is so generic that there was no requirement to base them on specific searches or LoE, but at the same time the group believed it is crucial to communicate them as a foundation on which the actual recommendations were based. However, while all three former overarching principles were maintained as formulated in 2010, the Task Force added a fourth one as overarching principle B. Treatment decisions are based on disease activity and other patient factors, such as progression of structural damage, comorbidities and safety issues. This is a new principle. It derives from previous recommendation 14, the last item of the 2013 version, which was deemed by the current Task Force to represent such a central and self-evident rule to any therapeutic approach that it should constitute an overarching principle rather than a recommendation. Indeed, in line with these considerations, the level of evidence of this recommendation had been rather low in 2013. Withdrawing this item from the recommendations elicited some discussions. Especially the patients brought forward that ending the list of recommendations with an item on patient-related factors would convey prominence to patient preferences and patient aspects in the management of RA. However, the reasoning that this item would even benefit more from being a general principle than a recommendation, which was unlikely to ever be studied in all its subtleties, prevailed to an extent that principle B was unanimously accepted (table 2). Rheumatologists are the specialists who should primarily care for patients with RA. Originally presented as item B, the wording of this principle was not changed. Of interest, in 2010 this was even presented as overarching principle A. However, over the last years, it was recognised that shared decision-making and considerations of patient factors should receive the most prominent recognition. Whether positioned as A, B or C, this item addresses the importance of specialty care for a complex disease like RA. There is compelling evidence that being cared for by a rheumatologist is advantageous for the patients in terms of early initiation of therapy, prevention of damage and reduction in surgical procedures.84–88 Moreover, rheumatologists have the most profound experience regarding the use of csDMARDs and bDMARDs. This includes the adverse event profiles of these drugs, as well as awareness of and experience with comorbidities in RA. Therefore, rheumatologists can provide the ‘best care’ in accordance with item A, in the sense of a holistic approach. The reasoning behind the term ‘primarily’ has been discussed amply in previous versions of the recommendations and relates to considerations of multidisciplinary care, including specialty nurses, and to the fact that in certain areas of the world rheumatology training is not sufficiently provided and other experts may have experience in the management of RA. Moreover, some comorbidities, such as chronic hepatitis or interstitial lung disease, may require consultation of, and treatment by, other specialists. RA incurs high individual, medical and societal costs, all of which should be considered in its management by the treating rheumatologist. Again, this principle is worded exactly as last time, except that it was item C, but also last.16 It is meant to remind all stakeholders that effective RA therapy—in spite of its direct costs—will reduce the economic burden on the individual patients, their families and society, which includes direct medical costs and indirect costs such as work disability and premature retirement. In this context, it must be borne in mind that direct medical costs accrue beyond those attributed to directly treating the overt manifestations of RA and include costs ensuing from comorbidities related to the inflammatory process. This point, however, is also meant to echo that cost-effective treatment approaches must be preferred as long as safety and outcomes are similar compared with more costly ones and in line with the therapeutic paradigms.46 In some countries, the high cost of treatment is an important factor limiting the availability of modern therapies (inequity), and this factor has to be considered when choosing a treatment strategy.89 In this respect, the advent of biosimilars provides potential for reduction of pressure on healthcare budgets.48 At this point, it also must be considered that many patients still do not attain the therapeutic targets, despite all of our modern therapies and therapeutic strategies. Furthermore, any of the bDMARDs, if applied after at least one csDMARD and a bDMARD has failed, leads to only about 10% good treatment responses in terms of ACR70 rates.90 These aspects impose the need to continue the search for new therapies or strategies. The Task Force's deliberative process resulted in 12 recommendations. The reduction by two recommendations compared with the past EULAR document may be somewhat surprising given the allegedly increasing intricacy of therapeutic modalities and strategies. However, the content of recommendation 14 was shifted into the overarching principles as discussed above. Moreover, item 11 of the 2013 version, which addressed the use of tofacitinib, was deleted as a separate item, because Janus kinase (Jak) inhibitors as tsDMARDs have now entered into and expanded other recommendations; this will be discussed in more detail in the context of items 8, 9 and 10. Also former recommendation 6, which addressed the use of csDMARD combinations, was deleted by the Task Force; combination therapy with csDMARDs and the reasons to remove it from its previous prominence within the list of recommendations and the algorithm will be addressed in the discussion on recommendations 4 and 5. While three of the 2013 recommendations were deleted via either complete omission or incorporation into other items, former recommendation 8 which addressed the absence or presence of prognostic risk factors was split into new recommendations 7 and 8; a detailed rationale for this decision is discussed below. The 12 recommendations form a logical sequence. They start with the need to initiate effective therapy immediately after diagnosis and the requirement to set a treatment target and to assess the disease on the way towards that target, employing a treat-to-target strategy. Such strategy has been strongly embedded into the recommendations since their first version in 2010. With these prerequisites in mind, different drugs or combinations of agents are recommended in the course of the therapeutic procedures, with suggested sequential increments, taking prognostic factors and all approved agents into account. They also mention some agents of potential future interest, even though not yet approved by international regulatory authorities. Thus, the recommendations also include a prospective view on drugs that have undergone phase III trials and were available for evidence assessment; obviously their actual prescription will depend on the regulatory approval status in individual countries. The set of recommendations concludes with suggestions towards reduction of therapy and even withdrawal of some drugs when the desired target has been attained and is sustained. 1. Therapy with DMARDs should be started as soon as the diagnosis of RA is made. This recommendation remained unchanged compared with 2013 and is one of the mainstays of any treatment approach to RA. It implies (i) the necessity to establish a diagnosis as early as possible, as has been reflected also in the 2010 ACR-EULAR classification criteria14 ,91 ,92 and (ii) the advantage of early initiation of DMARD treatment (‘as soon as possible’), which enables prevention of damage in a large proportion of patients.87 ,93–95 Because of the generic nature of this bullet point, the Task Force did not specify the type of DMARD here. Indeed, all DMARDs enable a better long-term outcome on early, compared with delayed institution, and the sequence of the types of DMARD therapies is addressed in subsequent recommendations. The Task Force did not deal with pre-RA or undifferentiated arthritis and thus assumed that a diagnosis of RA had already been made. However, it should be borne in mind that any chronic arthritis, even if undifferentiated, requires appropriate treatment, including consideration of DMARD therapy, because it usually does not subside spontaneously,96 ,97 and an update of the recommendations for management of early arthritis has just been presented by EULAR.70 With a LoA of 9.9, this recommendation achieved the highest agreement of all items (table 2). LoE 1a; LoA 9.9. 2. Treatment should be aimed at reaching a target of sustained remission or low disease activity in every patient. This recommendation addresses two treatment targets: remission, especially in DMARD-naïve patients, and low disease activity, primarily in patients who failed previous therapies. Since clinical remission or low disease activity are mentioned as the sole therapeutic targets, any higher disease activity state has to be regarded as inadequate disease control, thus mandating a therapeutic change, obviously unless patient factors preclude this.15 Communication with the patient to clarify and agree on the treatment goal and the means to attain this goal is of utmost importance. It allows alignment of the patient's and provider's considerations and aims and enhances adherence. In 2010, the notion ‘as soon as possible’ was also part of this item98 and in the current discussion it was specifically decided to mention that the treatment target should be rapidly attained rather than aiming to achieve it in a more distant future. Indeed, there is sufficient evidence that most patients who do not attain significant improvement within 3 months, or do not achieve the treatment target within 6 months, will not reach the desired state subsequently31 ,99–101; exceptions pertain to those patients whose disease activity has been reduced to a level close to the treatment target. It is important that the target-state should be sustained. The term ‘sustained’ is still not defined precisely, and different studies have used different definitions, but some voices in the Task Force suggested at least 6 months as a minimal time frame. This requires follow-up and a strategy to adapt therapy intensity upward or downward, aspects that are dealt with in subsequent recommendations. However, treatment intensification must take patient factors into consideration, especially risks and comorbidities (overarching principle B). LoE 1a; LoA 9.6. 3. Monitoring should be frequent in active disease (every 1–3 months); if there is no improvement by at most 3 months after the start of treatment or the target has not been reached by 6 months, therapy should be adjusted. This recommendation on treat-to-target is unchanged in position and formulation from the 2013 version. The frequencies of follow-up examinations should be adjusted in accordance with the level of disease activity, namely more frequently, such as monthly, when patients have high disease activity, and less frequently, such as every 6–12 months when the treatment target has been attained and sustained. EULAR generally recommends the use of a composite measure of disease activity that includes joint counts and the ACR-EULAR definitions for remission.22 ,111 Improvement by 3 months refers to the fact that if a minimal change is not achieved, there is only a low likelihood of reaching the treatment target. Thus, a change to a better disease activity state should be seen at 3 months or a relative improvement, pertaining to at least 50% improvement in activity by a composite score, at that point in time, in order to have a considerable chance of reaching the target.31 ,100 ,112 ,113 Of note, adjustment of therapy includes the optimisation of MTX (or other csDMARD) dose or route of administration,4 or intra-articular injections of GC in the presence of one or few residual active joints, and refers to a change of drugs only if these measures have not been successful or are not appropriate. Furthermore, in an individual patient the treatment target may not have been fully achieved yet at 6 months. But if disease activity is close to the target, one may think about continuing the effective therapy for a few more weeks to make a final judgement, especially since a considerable proportion of patients may attain the target at a slightly later time point than at 6 months.114 ,115 Consequently, the change in disease activity from baseline, and its slope should be considered when making treatment decisions. LoE 2b; LoA 9.5. Of note, at this point in time the Task Force decided to delete previous recommendation 6 (‘in DMARD-naïve patients, irrespective of the addition of GC, csDMARD monotherapy or combination therapy of csDMARDs should be used’). The inclusion or exclusion of combinations of csDMARDs within the bullet points elicited long debates within the respective breakout group and the whole Task Force (and the withdrawal of one Task Force member). The first ballot of the Task Force involved a choice of the following two wordings: (a) ‘MTX should be part of the first treatment strategy’ and (b) ‘in DMARD-naïve patients, irrespective of the addition of GC, csDMARD monotherapy or combination therapy of csDMARDs should be used’ (identical with the respective 2013 recommendation), with 23 votes favouring (a), 22 votes favouring (b) and one abstention. Therefore, further discussions took place. Advocates in favour of including combination therapy referred to publications suggesting its superior efficacy compared with csDMARD monotherapy and similar efficacy compared with biological agents120–124; moreover, in some countries, csDMARD combination therapy is recommended by the national societies as preferred initial therapy. It was also argued that a higher prevalence of adverse events when using combination therapy, even though often mild, may preclude escalation of therapy and result in not reaching a full dose of some of the drugs. Also, the SLR on csDMARDs did not show evidence for superiority of csDMARD combinations compared with csDMARD monotherapy.52 Moreover, the ACR Committee on the 2015 update of the ACR management guideline, in contrast to previous versions,131 did not longer recommend csDMARD combination as initial therapy, but prioritised MTX monotherapy.17 In line, the updated EULAR recommendations for the management of early arthritis do not advocate the use of csDMARD combination therapy.70 It was also pointed out that choice (a) included the term ‘treatment strategy’ and thus comprised the option to use csDMARD combinations. These discussions resulted in a new ballot between two versions for recommendation 4: (a) ‘MTX should be part of the first treatment strategy’ (as above) and (b) ‘MTX should be the first csDMARD, either as monotherapy or in combination with other csDMARDs’. In this second ballot a 71% majority voted for version (a). Thus, csDMARD combination therapy is no longer presented explicitly as initial treatment suggestion within the abbreviated list of recommendations. However, it should be mentioned that the simple fact that csDMARD combination therapy is not included in the bullet point anymore does not preclude using it. This is obviously at the discretion of the physician and the patient in light of all pros and cons that had been discussed (‘shared decision’). This recommendation ultimately attained a very high LoA (9.8). The Task Force was well aware that in some countries, such as in the UK or Canada, rheumatologists are required to use at least two csDMARDs before the application of bDMARDs is approved by the payers and that combinations of two or three csDMARDs are accepted in lieu of two csDMARD courses. However, for the reasons just mentioned, the Task Force was not in favour of the practice to define an IR to a combination of csDMARDs as a failure of two or more csDMARDs (when in reality it constitutes only one therapeutic strategy) nor to preclude the approval of bDMARD use when a first csDMARD has failed and the patient has bad prognostic markers (see below item 8 and table 1). LoE 1a; LoA 9.8. 5. In patients with a contraindication to MTX (or early intolerance), leflunomide or sulfasalazine should be considered as part of the (first) treatment strategy. The contents of this recommendation were maintained; however, compared with the previous version of item 5, the wording ‘in cases of MTX contraindications’ was slightly amended, because it is patients who have contraindications, rather than ‘cases’. The Task Force reiterated the relative safety of MTX and it was also discussed that the frequent fears of patients after reading the package insert should be addressed by providing appropriate information (overarching principle A). Nevertheless, there are occasional contraindications (eg, kidney or liver disease) or intolerances. Under these circumstances, leflunomide (dosed at 20 mg/day without loading dose)132 or sulfasalazine (escalated to 3 g/day) are regarded the best alternatives. Older trials have suggested similar efficacy for both these drugs compared with MTX, although MTX was used at much lower doses than recommended today.133 ,134 However, no new trials have been performed to disprove the previous conclusions. Among all the above agents, only sulfasalazine has an acceptable safety profile during pregnancy.135 In some countries, parenteral gold is still used and, while clinical efficacy is undisputed, there are controversies regarding its safety136 ,137; in other countries, gold salts are not available any more. In contrast, the use of antimalarials, such as hydroxychloroquine and chloroquine, is still substantial, especially in combination therapy122 or as monotherapy in patients with very mild disease,138 particularly in China. Interestingly, antimalarials may have significant positive effects on lipid and glucose metabolism139 and may reduce cardiovascular risk in RA.140 However, joint damage is not retarded to a similar extent as with other csDMARDs.141 This recommendation also uses the term ‘treatment strategy’ implying, as with MTX, that leflunomide and sulfasalazine can be used as monotherapy or in combination with other csDMARDs or biological agents.142–145 Indeed, step-up combination therapy is frequently employed, even though comparing step-up combination with switching of csDMARD did not reveal significant differences in outcomes.146 LoE 1a; LoA 9.0. 6. Short-term GC should be considered when initiating or changing csDMARDs, in different dose regimens and routes of administration, but should be tapered as rapidly as clinically feasible. The added efficacy of GC when combined with csDMARDs is well established. Indeed, hitherto all trials comparing GC plus csDMARD with bDMARDs plus csDMARD revealed similar efficacy.146 ,147 In 2013, GC were dealt with in recommendation 7, but the wording was different: ‘low-dose GC should be considered as part of the initial treatment strategy (in combination with one or more csDMARDs) for up to 6 months, but should be tapered as rapidly as clinically feasible’. The current wording constitutes a compromise attempting to accommodate most of the concerns and suggestions raised during the Task Force's debate. The term ‘low-dose’ was critically discussed. While all members of the Task Force agreed that high doses of GC should not be used for prolonged periods, it also became clear that the label ‘low-dose’ (which means a daily dose of 7.5 mg or less prednisone per day),78 ,148 while preferred by some Task Force members, does not capture several current ways of GC application. Indeed, recent clinical trials have revealed the efficacy of short-term GC, but at doses >7.5 mg/day, namely orally at 30 mg starting dose,126 as a single intramuscular injection of 120 mg methylprednisolone125 or as a single 250 mg intravenous pulse therapy of methylprednisolone.147 Therefore, the term ‘low-dose’ was deleted and replaced by ‘short-term’, leaving the choice about ‘dose regimens and routes of administration’ (another new piece of wording in this item) to the individual rheumatologist and patient. Indeed, it was argued that a single intramuscular or intravenous application entails a much lower cumulative dose than a few weeks of oral low-dose therapy, but this view was not shared by all Task Force members. Yet another change involved the replacement of the phrase ‘part of the initial treatment strategy’ by ‘when initiating or changing csDMARDs’. This change clarifies the intention of the Task Force, in that GC should be considered with all csDMARD starts, either as part of a first csDMARD therapy at the time of diagnosis or subsequently if an initial strategy has failed. Finally, the fact that csDMARDs are mentioned specifically implies that GC are typically not needed as a bridging therapy when bDMARDs or tsDMARDs are used, as these usually have a rapid onset of action and the infection risks may be potentiated.149 ,150 Thus, it is important to reiterate that the Task Force recommends using GC in combination with csDMARDs primarily as bridging therapy until the csDMARD reaches its maximum effect, and this should be done using one of the dosing and tapering approaches mentioned above, for which respective evidence exists. To reflect the position of the Task Force, the algorithm depicted in figure 1 was modified to show a ‘+’ for the use of GC in the new version rather than a ‘±’ as previously. Algorithm based on the 2016 European League Against Rheumatism (EULAR) recommendations on rheumatoid arthritis (RA) management. ACPA, anticitrullinated protein antibody; ACR, American College of Rheumatology; bDMARD, biological DMARD; bsDMARD, biosimilar DMARDs; csDMARDs, conventional synthetic DMARDs; DMARDs, disease-modifying antirheumatic drugs; EMA, European Medicines Agency; FDA, Food and Drug Administration; IL, interleukin; MTX, methotrexate; RF, rheumatoid factor; TNF, tumour necrosis factor; tsDMARDs, targeted synthetic DMARDs. By stating ‘…tapered as rapidly as clinically feasible’, the Task Force underlines that GC should be gradually reduced and ultimately stopped, usually within 3 months from treatment start and only exceptionally by 6 months. Long-term use of GC, especially at doses above 5 mg/day, should be avoided because of the many potential risks presented in the SLR.50 ,52 ,57 While some of these risk associations may be due to confounding by indication in patients with high disease activity,151 the evidence for increased overall and cardiovascular mortality at a dose above a threshold of 7.5 mg/day or a cumulative dose of 40 g is considerable.152 Of note, applying GC as a sole therapeutic change in patients with IR to csDMARD therapy does not convey good efficacy and is associated with significant adverse events.153 Moreover, if GC cannot be withdrawn within the time frame mentioned above, the DMARD therapy may have to be considered a failure. Finally, intra-articular GC application may have to be considered in certain instances, such as a residually inflamed or a reactivated joint. Some Task Force members advocated the chronic use of GC as a possibility for some patients; however, this proposal was not endorsed by the majority. While the bullet point on GC was, as in previous years, most heavily debated, the final wording received a 98% majority vote. However, the LoA was much lower (8.7), in line with previous versions of the recommendations. This relatively low LoA is presumably due to the fact that many Task Force members felt that this point was too liberal and the use of GC should be more restricted, while others were of the opinion that it was too restrictive. LoE 1a; LoA 8.7. 7. If the treatment target is not achieved with the first csDMARD strategy, in the absence of poor prognostic factors, other csDMARDs should be considered. This sentence constitutes the first part of previous recommendation 8. It is essentially worded in an identical way, except that the last portion, ‘change to another csDMARD strategy should be considered’, was reworded as ‘other csDMARDs should be considered’, in light of the fact that combination with GC has now been recommended clearly also for this step of the treatment algorithm (item 6) and combinations of csDMARDs are not specifically recommended as initial treatment strategy anymore. The poor prognostic factors are presented in table 1. The Task Force also discussed that early intolerance for a csDMARD should not be considered as a treatment failure, which would imply moving immediately to the next phase of the algorithm, but rather require reinstitution of another first csDMARD (replacement). LoE 5; LoA 8.5. 8. If the treatment target is not achieved with the first csDMARD strategy, when poor prognostic factors are present, addition of a bDMARD* or a tsDMARD* should be considered; current practice would be to start a bDMARD§. The separation of the second part of previous recommendation 8 (‘when poor prognostic factors are present, addition of a bDMARD should be considered’) and the new item 7 reflect the Task Force's desire to give stratification by prognostic factors more prominence. The bDMARDs currently available include a series of tumour necrosis factor (TNF)-inhibitors (adalimumab, certolizumab, etanercept, golimumab and infliximab); abatacept (a costimulation inhibitor); tocilizumab (an IL-6 receptor blocker, but in the future also possibly another IL-6 receptor inhibitor, sarilumab and IL-6 inhibitors, such as clazakizumab or sirukumab); rituximab (an anti-B-cell agent); both as biological originator (bo) DMARDs and as European Medicines Agency (EMA)-approved or Food and Drug Administration (FDA)-approved biosimilar (bs) DMARDs. This recommendation was also expanded to include tsDMARDs, namely the Jak-inhibitor tofacitinib and further Jak-inhibitors, such as baricitinib. In the 2013 update, tsDMARDs (then recommendation 11) were recommended for use after a bDMARD had failed. Since then, more data on tofacitinib, especially regarding long-term safety aspects, and new data for baricitinib have been published. The data suggest that baricitinib may be more efficacious than a TNF-inhibitor.154 Currently, the term tsDMARDs refers only to Jak inhibition. Tofacitinib is approved in many countries, such as in the USA, Latin America and Asia as well as some European countries, but at the time of developing the present recommendations still not in the European Union; baricitinib had completed phase III trials and was under regulatory review at that time and filgotinib and other Jak-inhibitors are undergoing evaluation in clinical trials (in the meantime baricitinib has been approved in the EU). However, similar to the 2010 recommendations, in which TNF-inhibitors had been given a slight preference over other biologics due to availability of long-term registry data for the former but not the latter, preference is given here to bDMARDs over Jak-inhibitors for the same reason. This notion on current practice is an expert opinion and not based on solid evidence. This bullet point still received a very high vote at the meeting and a high LoA. The Task Force also discussed whether the use of a bDMARD as first-line therapy should be reconsidered, as had been the case in the original 2010 recommendations. Such use has been tested in a large number of randomised trials and has consistently been found to be statistically superior to MTX monotherapy. Importantly, however, none of the respective phase III trials used a combination with de novo GC in the MTX monotherapy arm and the few investigator-initiated studies that compared first-line bDMARDs plus MTX with GC plus MTX (or with a combination of csDMARDs) did not show a clear clinical or structural advantage of early bDMARD therapy.127 ,147 Also, embedded within responders to initial treatment with bDMARDs+MTX are 20%–25% good responders to MTX alone, leading to overtreatment of these patients.13 Finally, it was shown that patients who had an IR to MTX but then rapidly received bDMARD responded to a similar extent as those who had started with the bDMARD plus MTX.68 Thus, this proposal for the early use of bDMARDs did not find a majority vote. Nevertheless, it is still conceivable that an induction regimen followed by the subsequent cessation of the bDMARD and continuation of the csDMARD may become a valuable option in the future; there is some support in the literature for such an approach.68 ,163–166 However, this would need further confirmation by additional trials before it could be put into place, especially also because the number of initial responders in whom tapering could be considered does not comprise a majority of the patients. The recommendation, as worded above, received 94% of the Task Force members' votes. LoE *1b, §5; LoA 9.0. For all these reasons the Task Force felt strongly (96% majority) that bDMARDs (and tsDMARDs) should primarily be added to, that is, combined with csDMARDs, such as MTX or leflunomide, leaving the option of monotherapy, with a preference for certain drugs, as an exception in case of intolerance or contraindication to all csDMARDs. LoE *1a, #1b; LOA 9.2. 10. If a bDMARD* or tsDMARD§ has failed, treatment with another bDMARD or a tsDMARD should be considered; if one TNF-inhibitor therapy has failed, patients may receive another TNF-inhibitor or an agent with another mode of action. A similar recommendation was presented in 2013: ‘If a first bDMARD has failed, patients should be treated with another bDMARD; if a first TNF-inhibitor therapy has failed, patients may receive another TNF-inhibitor or a biological agent with another mode of action’. Indeed, in a trial published after the elaboration of these recommendations, even primary non-responders to a TNF-inhibitor were shown to have some response to another anti-TNF, making it difficult to draw different conclusions for subsequent therapy for primary compared with secondary failures to TNF-blockers.176 The addition in the first part (‘or tsDMARD’) was partly needed because tsDMARDs (Jak inhibition) are now included in the earlier recommendations 8 and 9; ‘first’ was deleted, because the Task Force did not decide to distinguish between failure of one or more bDMARDs. However, it must be noted that it is currently neither known if a Jak-inhibitor is effective once another one has failed nor established that a second IL-6 receptor inhibitor or inhibitors of the IL-6 ligand are effective if tocilizumab has failed—this is still part of the research agenda. We also lack studies exploring if TNF-inhibitors are efficacious and safe after bDMARDs with other modes of action have failed, and also studies investigating switching between these other modes of action. A few members raised the question if the use of csDMARDs should also be considered when bDMARDs had failed, but this suggestion did not find a majority. The Task Force was also clear about its recommendations that any bDMARD, including another TNF-inhibitor, could be used if a TNF-inhibitor has previously failed. Thus, drugs with the same or with another mode of action are recommended in this situation. This was based on the data of clinical trials including meta-analyses158 and on the fact that in contrast to registry data, which may be affected by a variety of confounders, several new prospective studies suggest that there is no difference between these two approaches.177 ,178 If a second TNF-inhibitor fails, patients should receive an agent with another mode of action. However, it is self-evident (and supported by the vast majority of the Task Force members) that a bsDMARD of any of the reference boDMARDs should not be used if the respective boDMARD (or another bsDMARD of the same molecule) has failed to induce sufficient efficacy or vice versa. LoE *1a, §5; LoA 9.2. 11. If a patient is in persistent remission after having tapered GC, one can consider tapering bDMARDs, especially if this treatment is combined with a csDMARD. This item remained unchanged compared with the 2013 publication. No new data have been published that contest this conclusion. Tapering here means reduction of dose or extension of interval between applications (‘spacing’). It does not necessarily imply discontinuation of a bDMARD, which may lead to a recurrence of disease in a majority of patients.179 ,180 However, even if treatment is stopped and patients flare, the majority of them (>80%) will recover their previous good outcome on reinstitution of therapy (but some do not),180 ,181 and patients should be informed accordingly. There exist certain predictors in whom tapering will be likely successful and these relate primarily to early RA, depth of improvement and duration of remission182; prospective trials taking these aspects into consideration are needed in the future. This item also indirectly bolsters recommendation 9 on combination therapy of bDMARDs with MTX or another csDMARD, since it implies that bDMARDs should primarily, if not only, be tapered and possibly discontinued when combined with a csDMARD, while tapering and stopping of bDMARD monotherapy was not yet sufficiently studied. LoE 2b; LoA 9.0. 12. If a patient is in persistent remission, tapering the csDMARD could be considered. The 2013 version of the respective point 13 reads: ‘In cases of sustained long-term remission, cautious reduction of the csDMARD dose could be considered, as a shared decision between patient and physician’. This item elicited significant discussions, since it would mean leaving patients with RA either without any or with a low dose of a csDMARD. But in general, no new evidence for or against this view has been found over the last years. In the discussion, controversies emerged. It was mentioned that here tapering means primarily reducing the dose and that discontinuing csDMARDs may be possible only in exceptional cases. Many rheumatologists on the Task Force panel expressed a view stating that csDMARDs should never be stopped. Consequently, this item received the lowest LoA (8.5) of all, although still quite high on the scale of 0–10. Of note, the portion worded ‘as a shared decision between patient and physician’ was now deleted. It was felt by the Task Force that mentioning the shared decision for this item among all 12 would imply that the other recommendations may not need to involve the patient, or single out this specific recommendation in comparison with all other ones and thus offset overarching principle A. Obviously, the removal of this phrase does not mean that shared decision making with the patients is not important, on the contrary: in line with principle A it is of utmost importance for this and for all other recommendations. LoE 4; LoA 8.5. The updated recommendations are depicted in an abbreviated way in figure 1. Part and parcel of this figure are the respective footnotes as well as the full text as presented here. The 2016 update presents the hitherto ‘leanest’ EULAR recommendations for RA management. While in 2010 the document comprised 3 overarching principles and 15 recommendations and in 2013 it contained 3 overarching principles and 14 recommendations, the 2016 update arrived with 4 principles and 12 recommendations. Despite this reduction, in light of a continuously increasing spectrum of therapeutic options and new information on existing agents and therapeutic strategies, this update covers more treatment aspects and is built on a better evidence base than ever before. This is due to the availability of at least partial answers to several of the research questions posed in 2013, such as items 4, 6, 9 and 21,16 and of many new data on established and novel drugs as well as therapeutic strategies. The Task Force adhered to several principles established in the course of the development of the 2013 update and even in 2010. For example, aside from evidence on efficacy and safety, economic aspects were generally considered in line with respective general specifications.45 ,46 Also, agents that have not yet been approved by regulatory authorities but for which data from phase III trials were available, were considered with the caveat that their use would be only possible on such approval. This pertains to bsDMARDs, for which the Task Force relies on the stringency of the regulatory processes of EMA and FDA, for new IL-6 inhibitors and for Jak-inhibitors, the first of which was only licensed in some parts of the world at the time of developing these recommendations, with increasing availability of data on others. However, in the meantime baricitinib has been approved in the European Union. Finally, the Task Force reiterated its previous conclusions on the importance of stratification according to risk factors of adverse RA outcome,69 ,76 once an initial therapy has failed. The individual recommendations are not numbered by importance, but rather by a logical sequence: what is the treatment target and how should the patient be followed? What is the most prudent treatment approach once the diagnosis has been made? How can therapeutic success be maximised? Which therapies should follow a first treatment failure (phase I) and under which circumstances? Which agent or type of drug should be preferred in the course of the development of the treatment strategies? Consequently, the first three items, which were either left fully unchanged or were only minimally changed, deal with the time point of starting effective therapy (as soon as the diagnosis is made and thus without any loss of time); with the definition of the treatment target (sustained remission or low disease activity); and with monitoring and the need to reach a significant improvement of disease activity within 3 months and attainment of the targeted state within 6 months. The preferred instruments to be used when following patients have been defined in previous EULAR activities22 ,111 and comprise composite measures that include joint counts, such as the CDAI, DAS28 and SDAI as well as the ACR/EULAR remission definitions. Of note, instruments weighing acute phase reactants highly may exaggerate response, especially with IL-6 or Jak-inhibitors. The treatment target (stringent remission or low disease activity) continues to be clinically defined, since focusing at ultrasonographic remission has not shown better outcomes compared with targeting clinical low disease activity or stringent remission, but rather induced overtreatment and thus inefficient use of healthcare resources.108 ,109 Moreover, no strategy trial is available comparing the use of the serologic multibiomarker disease activity (MBDA) test with targeting remission using clinical disease activity assessment by a clinical composite measure (with which MBDA correlates anyway); of note, the MBDA test has been reported to improve to a larger extent on using a bDMARD that directly targets a cytokine compared with one that targets T-cell costimulation, despite similar clinical, functional and radiographic outcomes.183 Moreover, it must be assumed that such test would falsely indicate high disease activity when an infection occurs. For all these reasons, the Task Force recommends to follow patients in clinical practice using a composite measure which comprises joint counts and may include an acute phase reactant. This clinical assessment is pertinent for every therapeutic phase (figure 1). Subsequent recommendations, however, have undergone some significant changes compared with the 2013 update. While MTX (or in the presence of intolerance another csDMARD) continues to be considered the pivotal drug once the RA diagnosis has been made (item 4), it is recommended more strongly than before to escalate MTX to a dose of 25–30 mg weekly (with folate supplementation), given further recent insights on the high response rate with such strategy.4 ,118 Moreover, the combination of csDMARDs, as monotherapy, with GC is more strongly suggested than before in light of increasing evidence that this combination is not surpassed by csDMARD combinations, even if they are applied with GC, or bDMARDs plus MTX in terms of efficacy and safety.126 ,147 In the treatment algorithm (figure 1, phase I), this is reflected by the respective change from ‘±’ to ‘+’ for the addition of GC to csDMARDs. The term ‘low-dose’ GC has now been replaced by ‘short-term’ GC, given that various modes of application at different doses have shown to be efficacious. Moreover, the most important factors to reduce the risk of adverse event, such as cardiovascular events, infections, diabetes or hypertension,151 ,152 ,184 was deemed to be rapid tapering to discontinuation and a low cumulative dose of GC. This is, indeed, the case with these alternative GC treatment modalities. In contrast to the 2013 update, csDMARD combination therapy, with or without GC, is no longer an explicit part of the recommendations. This conclusion was based on the accruing evidence that this csDMARD combination therapy may not be superior to MTX monotherapy plus GC, but may be associated with an increase in adverse events.126 ,130 A recent indirect-comparison meta-analysis has suggested a superiority of csDMARD combination versus MTX monotherapy.185 This study was at odds with a previous direct-comparison meta-analysis35 ,186 and with our own SLRs,35 ,52 ,133 and indirect comparisons should also be considered with reservation since their rigour and value is insufficiently understood to date. Interestingly, using a somewhat different approach and based on an independent SLR, the ACR guideline has arrived at a similar conclusion as presented here and recommends MTX monotherapy as the first DMARD in early or established RA.17 However, the use of csDMARD combination therapy is not precluded by the new recommendations, rather it is at the discretion of the rheumatologist to apply it in the context of the recommendation on the use of MTX as a (first) treatment ‘strategy’. Once phase I has failed to reach the treatment target, either in the presence of bad prognostic markers or in the absence of bad prognostic markers after a second csDMARD strategy has failed, the Task Force recommends to add any bDMARD or, less preferably, a tsDMARD. 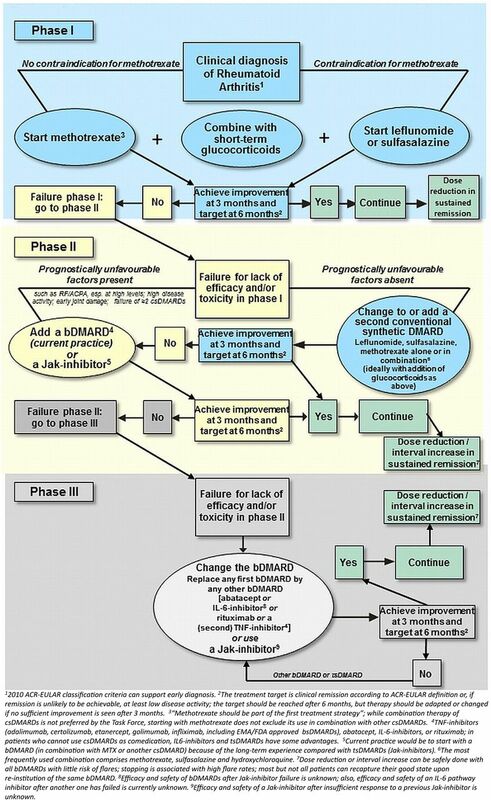 If phase II as depicted in the algorithm fails to arrive at the treatment target, another bDMARD or a tsDMARD should be used. The Task Force reiterated its position that if a TNF-inhibitor fails, another TNF-inhibitor—but not a biosimilar of the same molecule!—can be as effective as changing the mode of action. Vice versa, an effective biological agent should not be switched to another bDMARD for non-medical reasons. However, important data are missing for some of the drugs; for example, clinical trials did not address the efficacy of a TNF-inhibitor after bDMARDs with other modes of action or a Jak-inhibitor has failed. Similar questions arise for the other agents and also for the use of IL-6R or IL-6 inhibitors, such as sarilumab or sirukumab, after tocilizumab has failed (box 1). How does MTX monotherapy in combination with glucocorticoids compare with monotherapies of sulfasalazine or leflunomide in combination with glucocorticoids, at the doses of csDMARDs as used today? In what proportion of patients is an induction therapy with a bDMARD+MTX with subsequent cessation of the bDMARD effective in inducing sustained remission? Is the application of a TNF-inhibitor after abatacept, tocilizumab, rituximab or a Jak-inhibitor has failed, safe and efficacious? How safe and efficacious are abatacept, tocilizumab and rituximab after any of the other non-TNF-inhibitor-bDMARDs or a tsDMARD has failed? How safe and efficacious is the use of an IL-6 pathway inhibitor if another IL-6 pathway inhibitor/a Jak-inhibitor has failed? How safe and efficacious is the use of a Jak-inhibitor after another IL-6 pathway inhibitor/another Jak-inhibitor has failed? Is the risk stratification as recommended by EULAR after failure of MTX improving outcome in those with risk factors and not harming those without bad prognostic markers? Do patients who lack bad prognostic factors benefit as much from a switch or addition of a csDMARD as from the addition of a bDMARD? Can we find predictors of differential response to the different bDMARDs and tsDMARDs? When starting a DMARD, how can we best predict who will attain the treatment target (remission or low disease activity) and who not? Can we predict who will maintain remission after withdrawal of a bDMARD? Will we be able to develop precision (personalised, stratified) medicine approaches in RA? Is tapering of bDMARD monotherapy, where potentially indicated, comparable with bDMARD tapering in the presence of csDMARDs? Will RCTs on tapering of bDMARDs following the deducted predictors for successful withdrawal of bDMARDs show success? How good is patient adherence to a bDMARD or tsDMARD and can non-adherence explain secondary loss of efficacy? Is measurement of serum drug or antidrug antibody levels useful in clinical practice? Which biomarkers will help to find better predictors of bad outcome or response and which have failed in the numerous clinical trials that evaluated gene-expression and other biomarkers? What is the effect of csDMARD, tsDMARD and bDMARD therapies on cardiovascular outcomes and to which extent is a potential effect dependent on a clinical response? Is the use of telemedicine or e-medicine approaches as effective as direct contact in the clinic for treat-to-target strategies? bDMARDs, biological DMARDs; csDMARDs, conventional synthetic DMARDs; DMARDs, disease-modifying antirheumatic drugs; EULAR, European League Against Rheumatism; Jak, Janus kinase; MTX, methotrexate; RA, rheumatoid arthritis; RCT, randomised controlled trial; TNF, tumour necrosis factor; tsDMARDs, targeted synthetic DMARDs. Early bDMARD treatment, including an induction regimen with subsequent withdrawal of bDMARDs as supported by some strategy trials, was discussed but did not find a majority among the Task Force members. This decision was based on the lack of evidence for superiority of such therapy compared with the use of MTX plus GC. Moreover, when placed in the context of a treat-to-target strategy, the initial use of csDMARDs yields equal results in the long-term. Finally, the cost-effectiveness of first-line bDMARD therapy, especially in light of the reasons just mentioned, is very poor. The 2016 update of the EULAR recommendations is based on the most recent evidence in the area of RA management and on discussions by a large and broadly international Task Force. The recommendations synthesise the current thinking on approaching RA treatment in a set of overarching principles and recommendations. These have been informed by SLRs on the efficacy and safety of the drugs. The Task Force is convinced that adhering to these recommendations, including shared decision making, defining the treatment target, assessing disease activity regularly with appropriate instruments and applying the sequence of drugs as proposed and in a treat-to-target strategy, will maximise the overall outcome in a vast majority of patients with RA. Still, a considerable proportion of patients will not reach the target despite all efforts, and for these patients new drugs will be needed. Also, new information from research activities on treatment strategies, predictive markers and other aspects will become available in the near future and will likely necessitate yet another update of the recommendations in about 3 years; maybe we will then have new data on the research agenda, including precision medicine approaches in RA which allow predicting who will best respond to which drug at which stage of the disease. Until then we hope that the 2016 update will be broadly applied in clinical practice and/or serve as a template for national societies to develop local recommendations. The Task Force gratefully acknowledges the financial support by EULAR. Participation in EULAR Task Forces requires a priori declaration of conflicts of interest which has been done by all Task Force members. One Task Force member, who had attended the face-to-face meeting and had participated in all voting processes thereof decided to withdraw from the Task Force subsequently because some of that person's views had not found a majority during the voting process. This withdrawal occurred without casting a vote for the level of agreement with the recommendations. We thank this member for the contributions to the discussion process.
. Challenging the therapeutic pyramid: a new look at treatment strategies for rheumatoid arthritis. J Rheumatol 1990;17(Suppl 25):4–7.
. Suppress rheumatoid inflammation early and leave the pyramid to the Egyptians. J Rheumatol 1990;17:1117–8. , ed. Primer on the rheumatic diseases. 10th edn. Atlanta, GA: Arthritis Foundation, 1993.
. The effectiveness of early treatment with “second-line” antirheumatic drugs. A randomized, controlled trial. Ann Intern Med 1996;124:699–707.
. The world medicines situation 2011. Rational use of medicines. WHO/EMP/MIE/2011.2.2. Geneva: World Health Organization, 2011. OCEBM Levels of Evidence Working Group, Oxford Centre for Evidence-Based Medicine. The Oxford 2011 Levels of Evidence. 2011. http://www.cebm.net/oxford-centre-evidence-based-medicine-levels-evidence-march-2009/.
. SLR on safety aspects of DMARDs to inform the EULAR RA management task force. Ann Rheum Dis 2016. In press.
. SLR on bDMARDs to inform the EULAR RA management task force. Ann Rheum Dis 2016. In press.
. SLR on csDMARDs to inform the EULAR RA management task force 2016. Ann Rheum Dis 2016. In press.
. Prognostic factors for radiographic damage and physical disability in early rheumatoid arthritis. A prospective follow-up study of 147 patients. Br J Rheumatol 1992;31: 519–25.
. Radiographic outcome after three years of patients with early erosive rheumatoid arthritis treated with intramuscular methotrexate or parenteral gold. Extension of a one-year double-blind study in 174 patients. Rheumatology (Oxford) 2002;41:196–204.
. Baricitinib versus placebo or adalimumab in patients with active rheumatoid arthritis (RA) and an inadequate response to background methotrexate therapy: results of a phase 3 study [Abstract]. Arthritis Rheum 2015;67(Suppl 10):L2.
. Baricitinib, methotrexate, or baricitinib plus methotrexate in patients with early rheumatoid arthritis who had received limited or no treatment with disease-modifying anti-rheumatic drugs (DMARDs): phase 3 trial results [abstract]. Arhritis Rheum 2015;67(Suppl 10). http://acrabstracts.org/abstract/baricitinib-methotrexate-or-baricitinib-plus-methotrexate-in-patients-with-early-rheumatoid-arthritis-who-had-received-limited-or-no-treatment-with-disease-modifying-anti-rheumatic-drugs-dmards-p/ (accessed 4 Jan 2016).
. Radiographic, clinical and functional comparison of tofacitinib monotherapy versus methotrexate in methotrexate-nave patients with rheumatoid arthritis. Arthritis Rheum 2012;64:S1049.
. Assessing maintenance of remission with reduced dose etanercept plus methotrexate, methotrexate alone, or placebo in patients with early rheumatoid arthritis who achieved remission with etanercept and methotrexate: the PRIZE study. Ann Rheum Dis 2013;72(Suppl 3):399.
. Discontinuation of biologics in patients with rheumatoid arthritis. Clin Exp Rheumatol 2013;31(Suppl 78):522–7. JSS and RL co-first authors. JSS and RL contributed equally. Correction notice This article has been corrected since it published Online First. At the time of the online publication, baricitinib had received marketing authorisation in the EU; tofacitnib had already received a positive opinion but not yet marketing authorisation in the EU. This has now been obtained between online and print publication. Competing interests A competing interests statement of all authors is attached as online supplementary material.